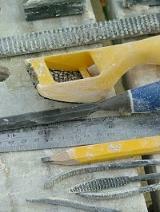 Stone Carving tools are one of the most essential components of stone sculpture. This site will provide information about carving softer stone which is very easy to work with such as Limestone. The carvings that you see on this site are all made from Oamaru Stone which is a major building stone from southern New Zealand. In future there will be information available in regards to sculpting harder stone. You will find this site useful for knowing which tools to buy from your sculpting supplies. A portable workbench - This is arguably the most important piece of equipment to add with your sculpture tools. I will discuss the safety aspects to be aware of and the advantages of height adjustable benches. Chisels - Types of chisels to match the type of stone you are using and how to use chisels properly. Mallets - Rubber versus wooden mallets and how to use them properly. Files and rasps - The best type of files and rasp for your carving. Riffler Files - What are riffler files? Why you should have them? Masonry sealer - Find out about why you need to seal your carving after you have finished sculpting it. Sand Paper - Find out what is the best type of sand paper to use to sand down a stone sculpture. Builder's pencils - You will need to use builder's pencils as a standard pencil will rapidly wear down.